Real Home Theaters has joined forces with United Audio Video Systems to bring you United Home Systems! 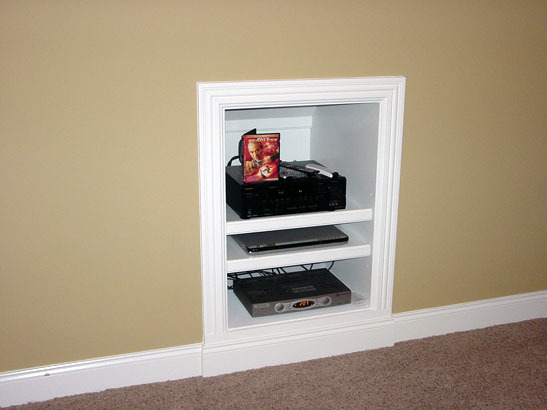 United Audio Video System and Real Home Theaters have served Middle Tennessee for over 20 years. UNITED AUDIO VIDEO SYSTEMS AND REAL HOME THEATERS HAVE JOINED FORCES TO BRING YOU UNITED HOME SYSTEMS. 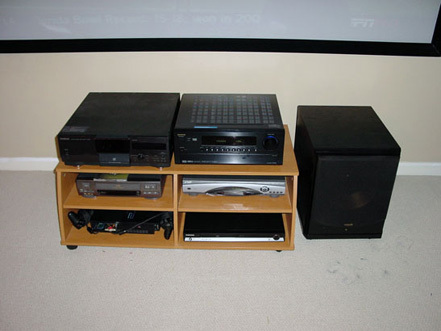 United Audio Video System and Real Home Theaters have served Middle Tennessee for over 20 years. Their combined experience totals almost 100 years servicing the audio video industry. Together they form an extremely talented group of system designers, programmers and installers to bring you superior service rivaled by no one in the industry. Place your confidence in the United Home Systems Team to service your home with exquisite attention to detail and the utmost care you deserve. Real Home Theaters is a full service custom home theater company, servicing Nashville and middle Tennessee with over twenty years of home theater experience servicing Nashville and the middle Tennessee area. 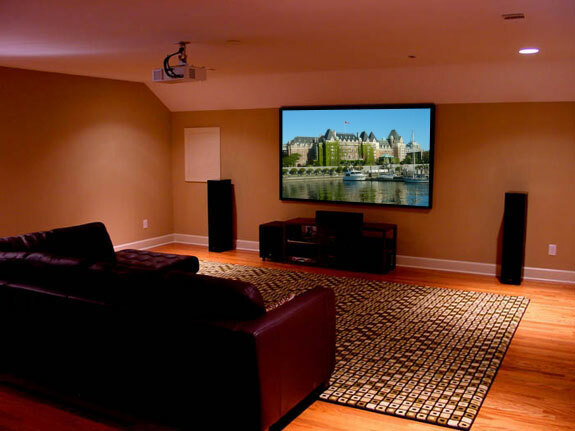 We specialize in custom home theater and flat panel LCD / Plasma TV Sales, Service and Installation and are driven to bring the movie theater experience straight into your home without the long lines, high price and hassle of a public theater. 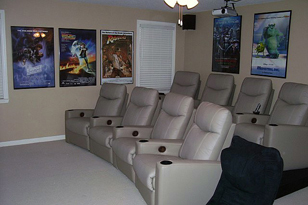 Each of our custom home theater rooms is built to fit your home, style and budget. 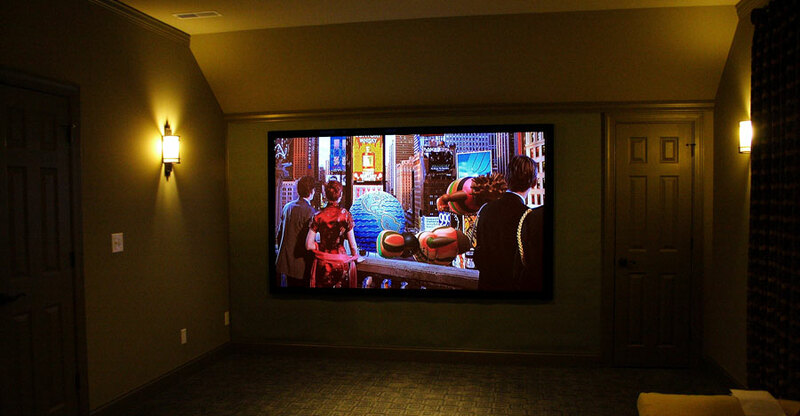 We can personalize any custom home theater with the equipment, installation and options that fit your needs. If you have been looking into any new home theater Audio / Video equipment, TV or need custom installation, but have more questions than answers, then you have reached the right place. Feel free to contact us via phone or email, and we will be happy to assist you in making the right decision. If you're planning on building a new construction home in Nashville or the middle Tennessee area, call us first, We can help customize your new home with the Home Theater system, TV, automation, Installation and low voltage pre-wire options you need and want. Ready to Build a Home Theater System? Consultations and Systems design services are FREE! 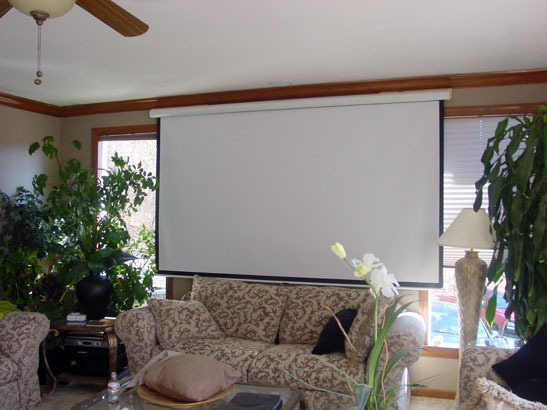 Call today and let one of our home theater specialists show you the options. Let us win you as a client! Want A Private Sports Bar? Give us a Call! 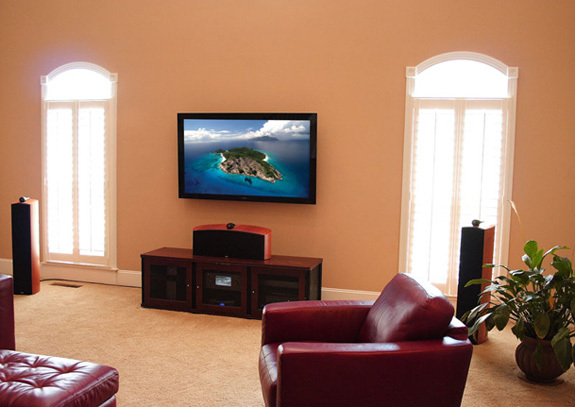 If you're thinking about getting a Real Home Theater, a new LCD or Plasma TV, or any home theater component Call Us! We will steer you in the right direction and give you advice on what products and installation fit your home theater needs and budget. We can come to your home and make on-site recommendations on what equipment and installation is right for you. 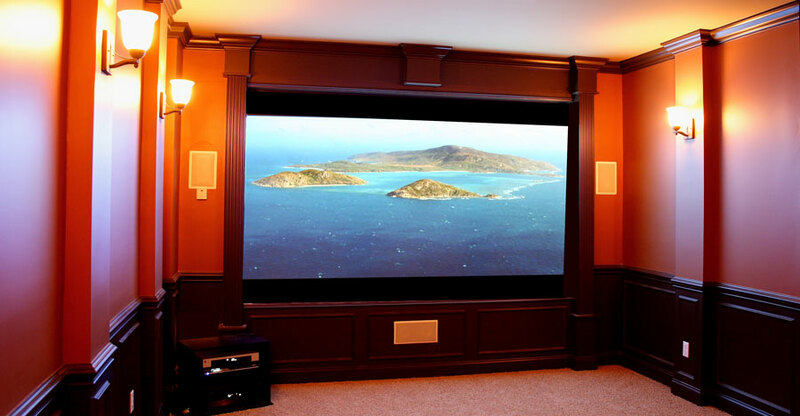 Whether you need a complete Home Theater, Installation, help with an existing system, remote consolidation, or a new component we're here to help! We have numerous packages ranging from $5,000.00 to $100,000.00 plus. Entry level home theater systems can start as low as $5,000.00 installed. An entry level home theater system can include a high definition projector, a screen up to 120 inches, a Blu-Ray DVD player, 7.1 audio package with speakers and subwoofer, all the cables required and custom installation. 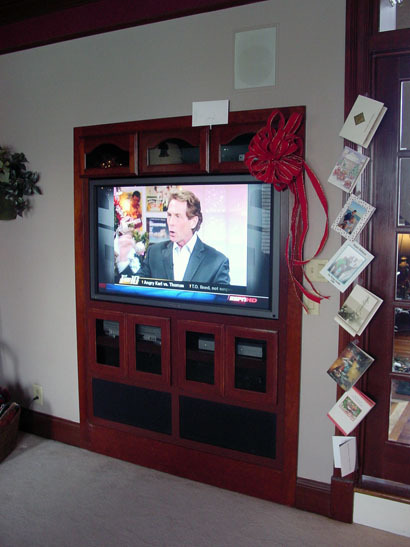 Give us a call and let us design a custom home theater or flat panel LCD / Plasma TV system that fits your needs! Real Home Theaters offers plasma and LCD TV 's. 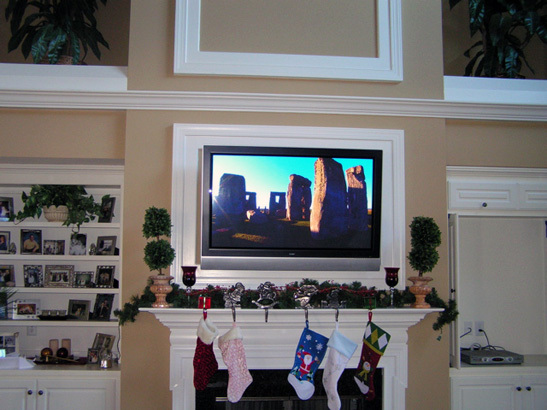 Pictured is an example of a 60" plasma TV installation in Brentwood, TN near Nashville. From a wall in the bedroom to over the mantel in the den, we have many flat panel TV and installation packages available from 32 to 65+". We also offer numerous surround sound systems to compliment your LCD or Plasma TV that can be installed with your home theater system to suit your taste. Call Today for a Consultation or Installation! Why Use Real Home Theaters? At Real Home Theaters, we realize that our customers are our biggest asset. We keep ourselves available for our customers, 24 hours a day 7 days a week and we spend as long as you need before and after your purchase to ensure we leave no question unanswered. 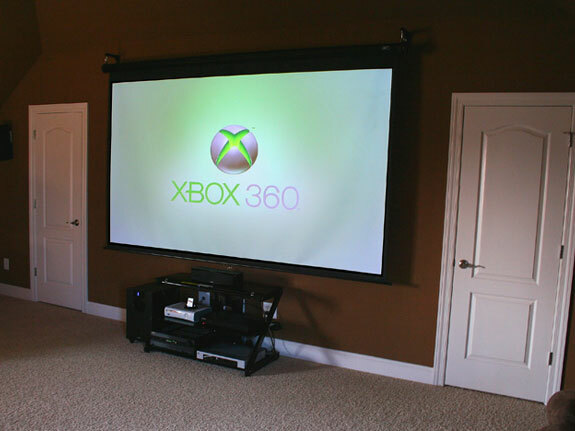 We're among the few in Nashville and middle Tennessee to offer a complete home theater projection system for $5000.00 installed. We differ from others, we only sell equipment that we are confident will fit your needs, and be compatible with future needs. We do this by asking questions so that we know what the equipment is being used for and explain options you may not have known are available. This makes your system much more enjoyable and user friendly. When givein an estimate we quote flat rate labor (not hourly) and include all parts to complete the installation. If it takes longer than expected there's no additional cost to you. You know what you're paying and what you're paying for before we begin. Most everyone has a room in their home that is use for entertainment, such as watching TV. But, the room is a certain size. So, why pay for audio equipment to put out enough sound to fill an auditorium or buy a projector that's designed to fill a screen twice as big as you need? We can design a home theater package that will fit most customers' needs for less money than they think they need to spend. The bottom line is, we can design a home theater system that fits your room, needs and budget without wasting money on equipment that you will never use to its potential. 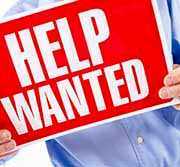 You can go to any electronics retailer and buy the home theater equipment or installation you think you need or trust an hourly salesperson to lead you in the right direction. But, if the wrong products are purchased and they don't have features you need or have so many features that you can't figure out how to use them, then their not a good value. Let one of our home theater, TV and surround sound specialists assist you in product selection and installation so you can enjoy your new equipment. We can take the confusion out of all the new, daily changing home theater technology and give you a system that is as simple as one button operation. Even if you don't need new equipment and you simply need someone to make sense of the equipment you currently own, call us and let us put the entertainment back into your entertainment system. We have access thru numerous distributors to virtually any product and any brand at competitive prices. No store front means low overhead and we pass that savings on to you. From audio / video and home theater flat panel LCD / Plasma TV equipment, seating and decor, cables and accessories to automation, structured wiring and installation we have you covered. We offer any high technology option for your home you can imagine even Central Vac, Data Networking and Security. We can pre-wire your new home during construction too. 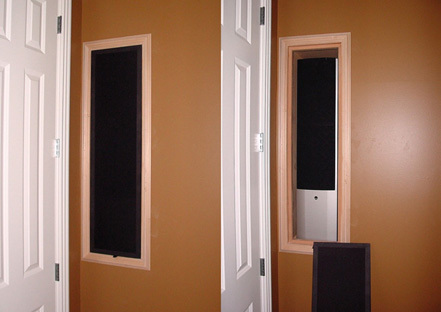 We have over 20 years experience in the residential/commercial audio / video home theater field. We have the knowledge and experience to design and install your custom home theater system to perform to its maximum potential. 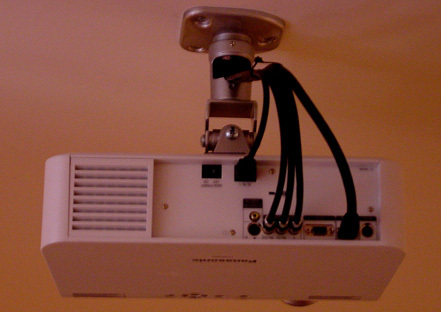 Any home theater system is only as strong as its weakest link. Don't let that weakest link be the company you buy it from. When you work with Real Home Theaters you deal with one person and that person will be with you from start to finish, form system design and product selection to installation and service down the road if needed. 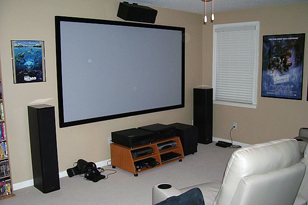 All of our employees are home theater sales, service and installation specialists with a vested interest in your satisfaction. Our business is based on two things customer satisfaction and value. 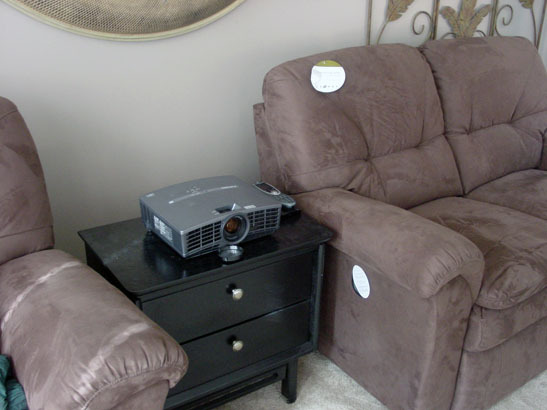 So let Real Home Theaters work for you and let us show you how much we value our customers. 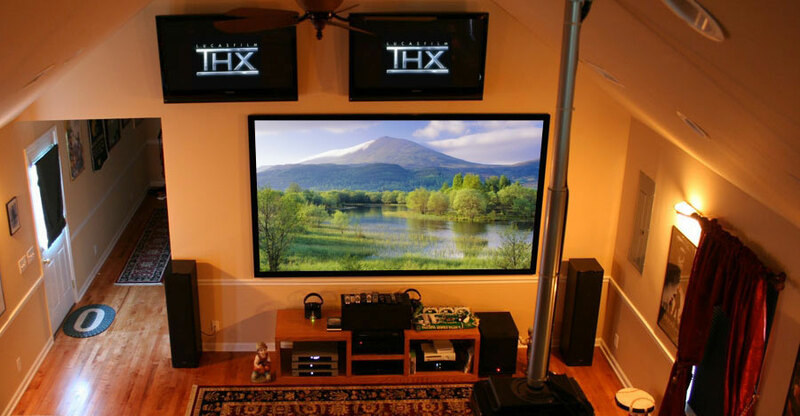 The team here at RealHomeTheaters has carefully hand selected every Home Theater component we sale. Each product has been tested for reliability, performance and ease of use. So, buy with confidence knowing that Real Home Theaters has taken the frustration and guess work out of selecting reliable easy to use components that do their jobs well. 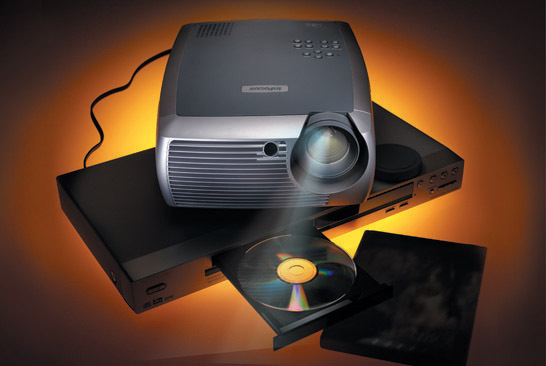 Video Displays, Home Theater Projectors, Projector Screens, Plasma / LCD TV Displays, Video Sources, DVD Players, Blu-Ray Players, A/V Receivers, CD / DVD Players, Speakers, Timber Matched Packages, Cabinet Speakers, In-Wall / Ceiling Speakers, Home Theater Accessories, Cables, TV and Projector Mounts, Remotes, Power Conditioners. New products are being added daily call if there is something you need that you don't see. This customer wanted to retain their formal sitting room. 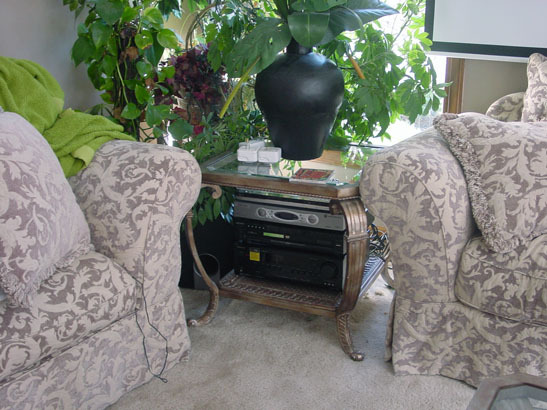 We installed their Home Theater equipment in an existing end-table in the corner, their projector on a table and their surround sound speakers behind plants. After these pictures were taken a wood case was built around the screen case and stained to match the trim. Roll up the screen, Mission Accomplished, You would never know this room transforms into a fully functional in home cinema. This 42" Plasma TV is mounted outside on the exterior brick of a pool house. During construction of this pool house the customer called and asked if we could allow him to watch the "Game" from his pool. We worked with his builder to re-design the floor-plan to allow for the end result you see here. We go out every winter to take the TV down to go inside and back every spring to get it ready for pool season. This Customers builder was nice enough to build a nice frame above the fireplace, even put an electric outlet in. But, NO cables for a TV. We were able to run the cables diagonally into a nearby cabinet. Pretty tricky! If your building a new home, know someone who is building, know a builder or are a builder, Call Us, before drywall goes in to save us some time and the customer some money. Here is another example of what is possible if you have a custom need. This room was designed during construction, however the options you see here are possible post-construction if the room allows. 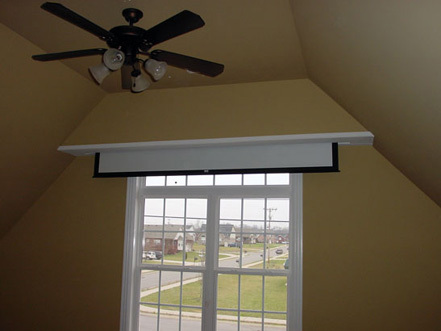 An electric screen is hidden in a custom frame that is covered in drywall and painted with the same paint as the rest of the room. Call us while your new home is under construction and the possibilities are endless. We have hundreds of examples like these. The bottom line is if you have an idea we can make it happen. Even if you don't have any ideas, we can give you hundreds. Give us a call and let us help build you a room to be proud of. This letter is written in recommendation of Real Home Theaters, who installed a custom home theater for us in October of 2006. We researched a lot of professional home theater installers in the Memphis area, but did not find one that fit our budget with the quality we were looking for. Real Home Theaters made a special trip from Nashville Tennessee (a 3-hour drive) just to do the job for us. We are thrilled with the amazing high-definition projection video and high-end audio system that they installed, and have been using it daily without any problems whatsoever. We were amazed at the speed with which they worked and their extreme attention to detail, as well as the finished result, which has to be one of the cleanest installations we have seen. They are very knowledgeable about their products and only recommend the highest quality component systems that offer the best value for your hard-earned dollar. Thanks to Real Home Theaters for doing a great job for us; we are the envy of the neighborhood and have already referred several neighbors to Real Home Theaters for their home theater needs. 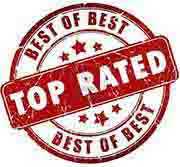 I would not hesitate to recommend them for your needs. I called these guys shopping for a new projector. After answering a few of their questions they convinced me my projector was fine and that all I needed was a new cable. The company that originally installed my system had used a composite cable to run the video to the projector these guys explained I needed a component cable. After shopping around I decided to buy the cable they recommended. All the other 30ft component cables I could find where over 200 dollars that looked of this quality. It worked, the picture is better than it ever was. The cable is great the service is even better. I was willing to spend several thousand dollars on a new projector, instead I paid $$ dollars for a new cable and got some really good advice for free. If you need help or home theater electronics call these guys, they WILL steer you in the right direction. A: We are willing to travel almost anywhere to service our customers. In some cases there may be a small fee to cover travel expenses. Below is a list of cities we cover on a regular bases. If you are located in an area not listed please call! Middle Tennessee, Adams , Allardt , Allons , Alpine , Antioch , Ardmore , Arnold AFB , Ashland City , Baxter , Beech Grove , Bell Buckle , Belvidere , Brentwood , Brush Creek , Buffalo Valley , Burns , Byrdstown , Carthage , Castalian Springs , Cedar Hill , Celina , Centerville , Chapel Hill , Chapmansboro , Charlotte , Clarkrange , Clarksville , Clifton , College Grove , Collinwood , Columbia , Cookeville , Cornersville , Cottontown , Cowan , Cross Plains , Crossville , Cumberland City , Cumberland Furnace , Cypress Inn , Decherd , Dickson , Dover , Eagleville , Elkton , Erin , Ethridge , Fairfield Glade , Fairview , Fayetteville , Flatwoods , Fort Campbell , Franklin , Gainesboro , Gallatin , Golden Pond , Goodlettsville , Granville , Grimsley , Hampshire , Hartsville , Hendersonville , Hermitage , Hilham , Hohenwald , Hurricane Mills , Iron City , Jamestown , Joelton , Kelso , Kingston Springs , La Vergne , Lafayette , Lancaster , Lawrenceburg , Lebanon , Leipers Fork , Lewisburg , Linden , Livingston , Lobelville , Loretto , Lynchburg , Lynnville , Madison , Manchester , McEwen , McMinnville , Millersville , Monroe , Monterey , Mount Pleasant , Mt. Juliet , Mulberry , Murfreesboro , Nashville , New Johnsonville , Nolensville , Normandy , Old Hickory , Only , Pall Mall , Pegram , Pleasant Hill , Pleasant View , Pleasantville , Portland , Pulaski , Red Boiling Springs , Ridgetop , Rock Island , Saint Joseph , Sewanee , Shelbyville , Silver Point , Smithville , Smyrna , South Carthage , Southside , Sparta , Spencer , Spring Hill , Springfield , Summertown , Triune , Tullahoma , Tupelo , Unionville , Vanleer , Walling , Wartrace , Watertown , Waverly , Waynesboro , Westmoreland , White House , Whites Creek , Whitleyville , Williamsport , Winchester , Woodbury , & Woodlawn Tennessee. We've been in the home theater bussiness for a long time! See our work previous to 2009. We have custom home theater, surround sound and plasma / LCD TV installation specialists on-call in Nashville to serve you. There are consultation and installation appointments available in the following Nashville and middle Tennessee areas on a daily basis. Home theater system demos are available at numerous Nashville and middle Tennessee locations. Thank you for choosing us as the Home Theater and Flat Panel LCD / Plasma TV Installation Authority in Nashville Tennessee! It's an honor to service Nashville and the middle Tennessee Area. 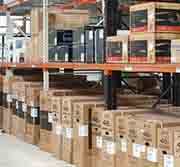 Products In-Stock and Ready for Delivery! TV / Home Theater / Home Automation Installers: Experience Preferred. "ONLY A/V COMPANY TO USE!" The Home Automation System in this luxury home located in Brentwood, TN was awarded "Best Home Automation System in Tennessee" and "2nd Place in the Nation"!